Morgan Gilbert gets the third out in the top of the eighth to keep West Liberty-Salem off the board in 2-1 Lady Wave opening day win. Grace Shaffer pitches for the Lady Wave in Saturday season opener. Lani Shilt opens eighth inning play with a hit to center in Lady Wave win over WL-S.
Haleigh Mayo-Behnken drops down a purfect bunt single for the Lady Wave in eighth inning to load the bases in 2-1 win over WL-S Lady Tigers. Greenville coach Jerrod Newland gives a sign to Zoe Pressnall before the Lady Wave junior knocks in the winning run to give LWSB a 2-1 extra inning win over West Liberty-Salem. 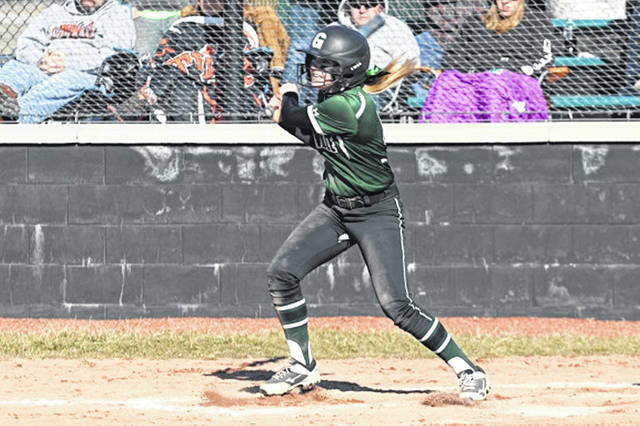 Zoe Pressnall drives in the winning run in extra innings to give the Lady Wave a come-from-behind win over the West Liberty-Salem Lady Tigers. Grace Shaffer picks up a win over West Liberty-Salem in second game of Saturday double-header to record her second win of the day. 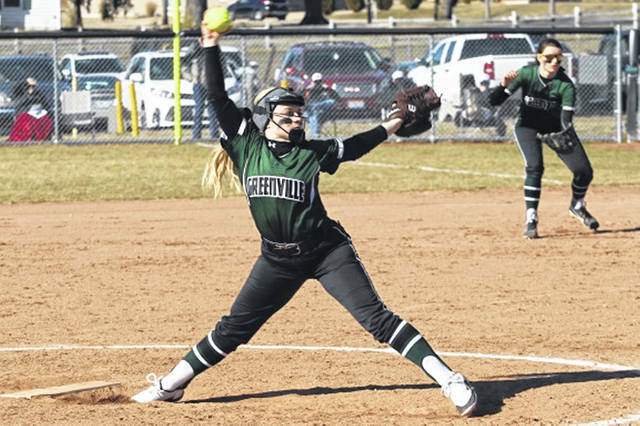 GREENVILLE – The Lady Wave opened 2019 season 2-0 in a Saturday opening day double header starting with a 10-0 run-rule win over the Wayne Lady Warriors and downing the West Liberty-Salem Lady Tigers 2-1 in extra innings in the second game of the day at Stebbins Field, home of the Lady Wave. The Lady Wave junior varsity girls defeated the Wane Lady Warriors JV squad 13-3 with freshman Karmen DeHart picking up her first win at the high school level. Lady Wave sophomores Kennedy Fashner and Grace Shaffer each pitched three shutout innings against the Lady Warriors with Shaffer pitching the final three innings to pick up the win. Game No. 2 had the visiting Lady Tigers and the Lady Wave playing to a 0-0 stalemate after five innings of play before West Liberty-Salem plated a run in the top of the sixth to grab a 1-0 lead. Down to their last out in the bottom of the seventh inning and bases empty, Lady Wave sophomore Allison Powell coaxed a 2-out walk with Coach Newland inserting Saige Fellers to pinch run with the freshman scoring by way of a first pitch double off the bat of Morgan Gilbert to score Fellers and send the game to extra innings tied 1-1. With Shaffer on the mound, the Lady Wave kept the Lady Tigers off the board in the top of the eighth with Gilbert throwing across the diamond from her shortstop position to get the final out bringing the Greenville girls to the plate in the bottom of the inning. Greenville’s lone senior, Lani Shilt led off the bottom of the eighth with a soft fly ball between short and center dropping for a hit while racing to second beating the tag at the base on a heads-up play to put a runner in scoring position with no outs. Next up, Fashner received an intentional walk putting runners on first and second followed by a perfectly placed bunt off the bat of Haleigh Mayo-Behnken loading the Lady Wave bases with no outs. Zoe Pressnall followed with a walk-off single to left on a drawn-in Lady Tigers infield to give the Lady Wave a come-from-behind 2-1 win and go 2-0 on the new season. Grace Shaffer recorded both wins to go 2-0 on the day. 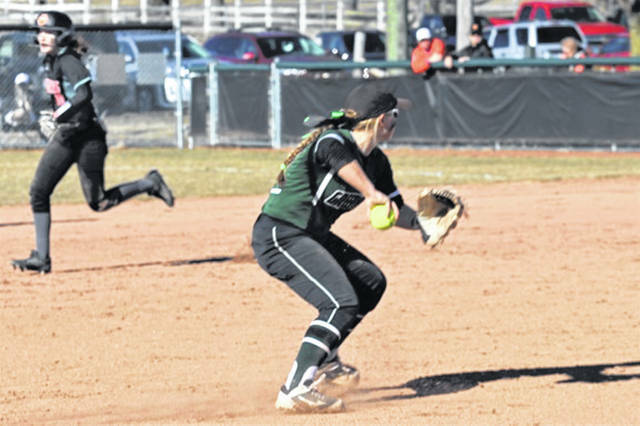 https://www.dailyadvocate.com/wp-content/uploads/sites/34/2019/03/web1_Gilbert.jpgMorgan Gilbert gets the third out in the top of the eighth to keep West Liberty-Salem off the board in 2-1 Lady Wave opening day win. 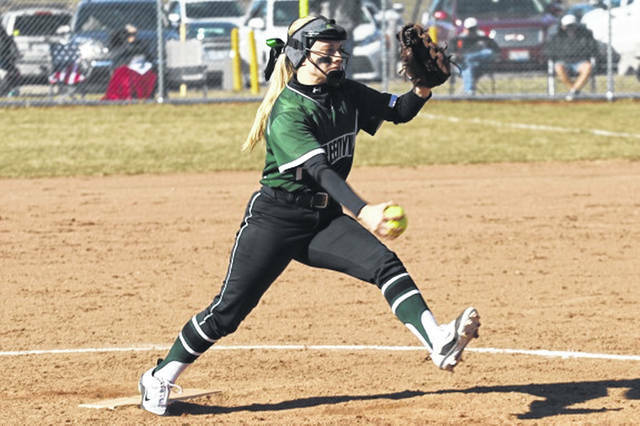 https://www.dailyadvocate.com/wp-content/uploads/sites/34/2019/03/web1_Grace-Shaffer-2.jpgGrace Shaffer pitches for the Lady Wave in Saturday season opener. 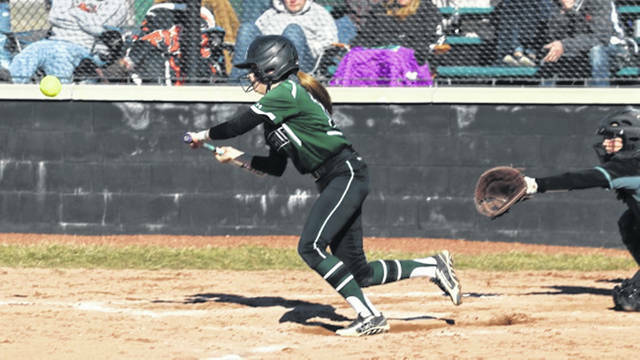 https://www.dailyadvocate.com/wp-content/uploads/sites/34/2019/03/web1_Lani-Shilt.jpgLani Shilt opens eighth inning play with a hit to center in Lady Wave win over WL-S.
https://www.dailyadvocate.com/wp-content/uploads/sites/34/2019/03/web1_Mayo.jpgHaleigh Mayo-Behnken drops down a purfect bunt single for the Lady Wave in eighth inning to load the bases in 2-1 win over WL-S Lady Tigers. 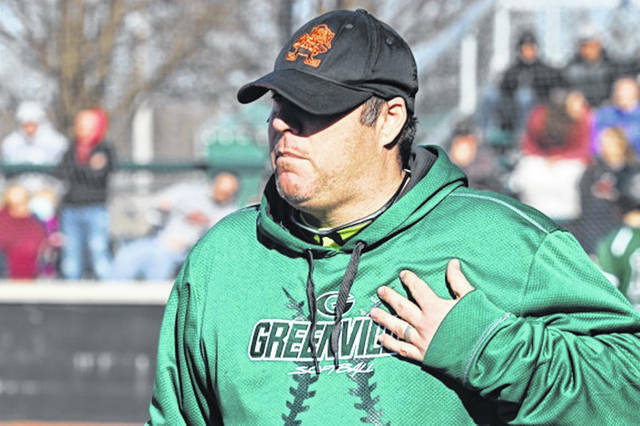 https://www.dailyadvocate.com/wp-content/uploads/sites/34/2019/03/web1_Newland.jpgGreenville coach Jerrod Newland gives a sign to Zoe Pressnall before the Lady Wave junior knocks in the winning run to give LWSB a 2-1 extra inning win over West Liberty-Salem. 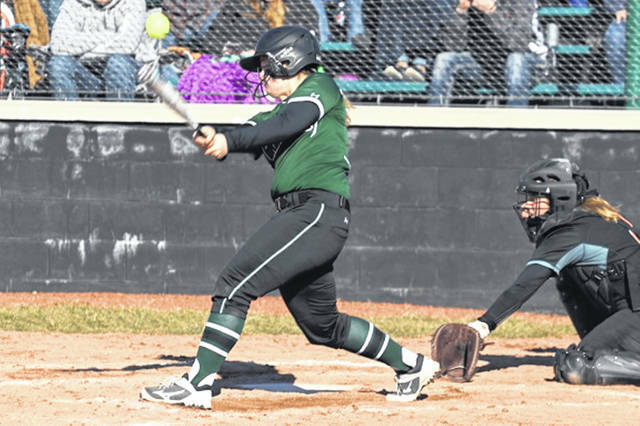 https://www.dailyadvocate.com/wp-content/uploads/sites/34/2019/03/web1_Zoe-Pressnall.jpgZoe Pressnall drives in the winning run in extra innings to give the Lady Wave a come-from-behind win over the West Liberty-Salem Lady Tigers. https://www.dailyadvocate.com/wp-content/uploads/sites/34/2019/03/web1_Shaffer-1.jpgGrace Shaffer picks up a win over West Liberty-Salem in second game of Saturday double-header to record her second win of the day.